The Spanish National Fútbol Team was forced to play in their yellow (mustard) away jerseys Thursday, something they were loath to do being that yellow is supposed to be a bad luck color. 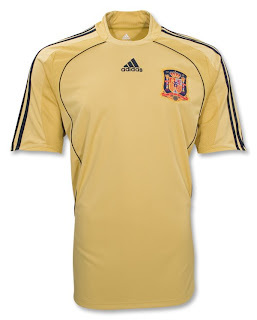 Well, maybe they should wear it more often as Spain produced their most outstanding performance in the Euro 2008 since playing Russia two weeks prior. Now, La Selección is back in the European Championship final after 22 years, and hoping it ends better than that one in ’84. If Spain plays as well as they did yesterday on Sunday, more than 10,000 Spaniards better get their razors ready.